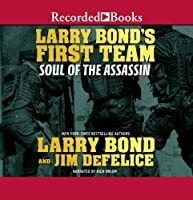 When the CIA is tipped off that one of its most wanted men is going to be in Bologna, Italy, Ferg and the First Team are tasked to apprehend him at any cost--but under no circumstances can Italian authorities be made aware. There is just one problem: no one has seen the man in over ten years, and he is only known by a decades-old code-name: T-Rex. This assassin has been involved in the murder of at least a dozen prominent western leaders, and the grapevine reveals he's been called out of a long, silent hiding for one more major strike. Ferg and the Team arrive in Italy, where they recruit the help of a beautiful French Samaritan named Jane Foucoult. Her knowledge leads them on a search that goes behind the scenes of a conference on genetics and onto a trail to a sinister Russian scientist, a leader at the forefront of biological-weapons research. Splitting the team in two, Ferg and Guns go after the ghosts they speculate could be T-Rex, and Rankin and Thera get on the scientist's tail. But what they uncover is way beyond a single assassination attempt, and they find themselves about to go head-to-head with the most lethal terrorist cells known to man.